No one wants to talk about what's up our noses - except maybe preschoolers - but certain times call for it. The holiday season is one of them. Traveling and social events bring people closer together, making us more vulnerable to the flu, colds, and other bugs, say experts. 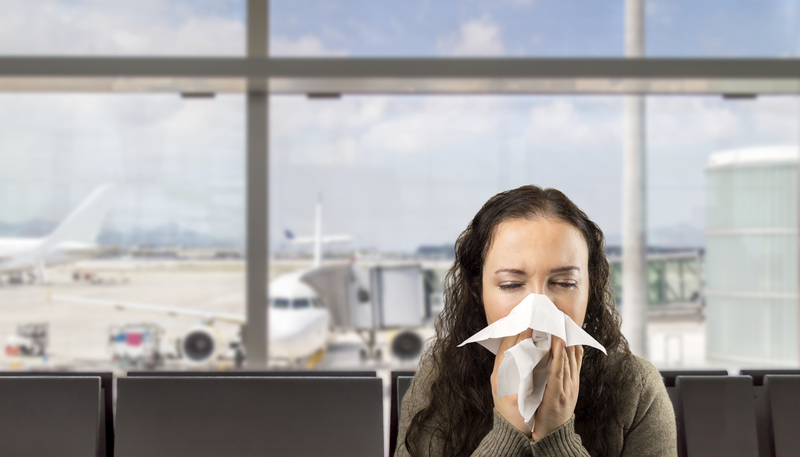 If your holiday plans involve being cooped up for hours in an airplane full of sniffling fellow travelers, illness may seem inevitable. But a few simple steps can help reduce your risk of infection during the holiday season and beyond. "The bottom line is, infections go between people," said Dr. Warren Licht, an internist who specializes in travel medicine at Lenox Hill Hospital in New York. "You have to have a vector." There are a number of ways to help sidestep sickness in general, Licht says, and washing your hands frequently is a good start. The U.S. Centers for Disease Control and Prevention says there's even a right way to do it: lather up with lots of soap and water (front and back of your hands), scrub for at least 20 seconds (hum the "Happy Birthday" song twice through), and rinse well before drying. When you're traveling - whether by airplane, train, or subway - get in habit of washing your hands whenever you're near a sink, said Licht. "If you don't have access to a bathroom or sink, as an alternative [use] hand sanitizer often," he said. And don't forget your kids' hands, too, said Dr. Amy Sniderman, a pediatrician at Cleveland Clinic Children's Hospital. "Kids need frequent reminders. If you're traveling with children, encourage them to use a hand wipe or hand sanitizer before and after eating meals, and after using the restroom," Sniderman told CBS News. Don't go crazy about it, just use common sense, she said. "You don't need to hand-sanitize on the subway five times. Perhaps when getting off the airplane or subway, use a wipe or soap and water when available." So where do the contents of your nose (or other people's) come in? Licht said, next to inhaling infectious particles in the air, the most common way to get sick is by touching germy surfaces and then putting your (germy) hand to your mouth or nose. "You want to avoid putting your hand on your face. Most people touch their face many times a day, even an hour, without even knowing it. If you consciously say, 'Stop touching my face with my hand,' you'll reduce the risk of getting an infection during flu season," said Licht. When flying, Sniderman suggests swiping an antibacterial wipe over the tray table before eating. If you're traveling with young children, wipe up their tray tables again at the end of the flight, to keep from spreading their germs. One recent study found seat-back tray tables were by far the germiest surfaces tested in an airplane cabin, with about eight times more bacteria, on average, than the lavatory flush buttons. There's less you can do if a person nearby sneezes into the air, except remind them, for everyone's sake, to use a tissue or direct the sneeze into the inside of their elbow. The average human sneeze expels a high-velocity cloud that can contaminate a room in minutes, a new study by Massachusetts Institute of Technology scientists finds. In a separate MIT study on coughing and sneezing published last year, the authors wrote, "Confined environments, such as airplanes, hospitals and schools, serve as mixers where pathogens can stay suspended and spread from host to host." Getting a flu shot could help protect you from at least some of those germs. Each year, on average, five to 20 percent of people in the United States get the flu and more than 200,000 are hospitalized from seasonal flu-related complications, the CDC reports. According to Walgreen's Flu Impact Report, 91 million days of school were missed due to flu-related illness in 2013-14. But only about 42 percent of adults and 59 percent of children under 18 get the flu vaccine each year to help protect themselves. The CDC recommends it for virtually everyone over the age of six months, especially people older than 65 because between 80 and 90 percent of flu-related deaths occur in that age group. Last year's formula was less effective than usual, but the CDC says normally the vaccine can reduce the risk of hospitalization by more than 70 percent. There are other preventive measures you can take to bolster your ability to fight off infection during holiday travel, and all year long: "Eat well, sleep well, and exercise," said Licht. If you live a healthy lifestyle 365 days a year, you'll be in better shape to protect yourself while traveling, he said. "There is some data that suggests eating less simple carbohydrates, refined sugars, and potentially taking probiotics every day may very well reduce your chance of getting infections. The scientific reason behind that is that most bacteria that lives in your body lives in your intestinal tract and if you have good intestinal flora you're protecting yourself. A lot of your body's immune system is focused in your gut," said Licht. Sleeping is also important to overall health, not just for memory and learning, he said. "Your body needs time to regenerate. Your ability to fight infection is better if your body is well rested on a continuous basis." Licht said moderate-intensity exercise for 45 minutes, five times a week is also linked to catching fewer colds. If you do get sick, Licht said, at the start of any cold or flu, think of your fellow man. "The first few days when you're most infectious, as a responsible member of society, you should stay home from work and school," he said. If you must go out sick, one of the top things you can do to protect others is to cough or sneeze into a tissue or the inside of your elbow, he said. And he brings up hand-washing again, reminding sick ones to wash often. "If you sneeze on your bare hands, everything you subsequently touch becomes infectious," he said. If you come down with the flu, there are prescription antiviral drugs like Tamiflu or Relenza that can lessen the severity of the illness. Seeing your doctor early for treatment is important, especially for the elderly, the very young, pregnant women, and people with chronic illnesses. Sniderman said if you're far from home when illness strikes, call your health care provider back home first to discuss your symptoms or your child's and get advice on whether you need to see a healthcare provider in the area you're visiting. "If your child has a fever over 101 degrees, or is acting unlike himself, irritable, not urinating as much as usual, or his breathing seems funny, go ahead and call your regular primary care doctor who can help you decide if care is needed locally," Sniderman said. If your doctor recommends medical care, a family member you're staying with may have a doctor you can call, or you can try a local clinic. "There's always urgent care nearby. I think if it is a minor illness, sore throat, cough, ear pain, then that's reasonable to go to an urgent care or retail based pharmacy. But if a child's having trouble breathing, or a high fever, you would probably do better to visit an emergency room setting. But again, that's' where a call to your primary care physician helps." What if you get stuck next to a sneezing, sniffling person on the plane or must sit by flu-ridden Aunt Sally at Thanksgiving dinner? "Politely ask them to cover their mouth with a tissue. Ask them to sneeze or cough into a tissue, not in your direction. If you're on an airplane, I recommend turning the vent on above you and have it come straight down over your nose and mouth," Licht said. Better for sick ones not to dip into the communal chip and dip bowls, too -- give them their bowl or plate of appetizers, Sniderman suggested. And don't share beverage glasses. But don't cancel your holiday plans for fear of coming down with a bug, Licht said. "Traveling during the holiday season and visiting loved ones is important from a health perspective. One needs to just be conscious about -- not overly wary -- but conscious about practicing proper hygiene as well as having the public's interest in mind by not exposing your sick self to other people," Licht said.